For quite some time, I used to buy Paneer at a local Indian grocery store. But once I tried making Panir at home, I realized that not only it is easy but also half the price of store bought Paneer. So if you are looking for fresh cottage cheese and to save a few bucks, you must give this recipe a try. Heat milk in a thick bottom vessel. Keep stirring every 5 minutes to avoid sticking. I prefer boiling milk at low flame. When milk starts boiling, add lemon juice gradually and stir as well. Turn off the heat. Curdling will start within a minute. Let it rest for about 20 minutes. You can use vinegar or curds/yogurt for curdling the milk. I prefer freshly squeezed lemon juice. Make arrangements for a sieve/strainer lined with a thin cotton cloth. I use 4 layers of a thin cotton cloth. Wet the cloth slightly. Pour the curdled milk and let it strain for about 30 minutes. Paneer will be collected in the cloth lined sieve. The filtered liquid left called as whey can be used for kneading dough/atta for roti. Rinse the paneer under running water so that the lemon juice is washed off. When its cold enough to handle, gather the edges of the cloth and squeeze with hands to remove whey from the paneer. Wrap the paneer in the same cloth and place heavy weight on it for about an hour or two so that all the water is removed. Alternately, it can be hung as well. Use Homemade Paneer for sweets or curries. Store the paneer refrigerated or frozen. nice n yummy...soft and hygienic! perfect..I make the same way too ! 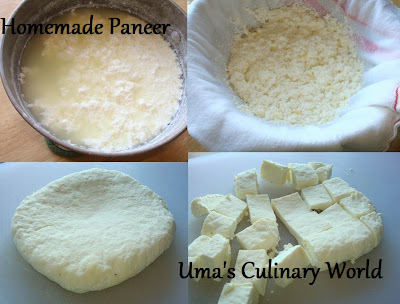 Prefectly prepared paneer, homemade are always best..
nothing like homemade paneer. will wait for what you cook next with this. Instead of adding Lemon, u can try adding curd.& if still required(not satisfied can add lemon).This will make paneer more calcium rich. i practice it & the paneer is very soft. Thanks Suvarna for this tip.. I'll try it next time..